We begin each section with a brief description and consider several of the most well-rated products within the category. Keep in mind that a pro for one artist might be a con for another. With certain types of cleaners, toxicity is an issue that deserves consideration. Some products are more toxic than others, requiring certain safety precautions. For example, mineral or white spirits (also known as paint thinner) should be kept out of reach of small children and pets, used in a well-ventilated area and kept away from combustible materials and heat. If ingested, it is necessary to call a poison control center. There are many products on the market that claim to be odourless (which should not be confused with non-toxicity) or less dangerous than traditional mineral spirits. We’ve included many of these brands in this article, but remind the reader that the claims come directly from the manufacturer. The toxicity claims have not been tested by WonderStreet and we advise caution when using any chemical cleaning product. Please also note that we are not connected to any of these brands and that our recommendations are based entirely on artists’ viewpoints, not our own. We’d love to hear more from you on this subject. Tell us about your favourite way to clean up after your creative process in the comments section below! In this category, we explore the various models and systems for holding cleaning solvents and dirty brushes – the brush washers and cleaners. There is a lot of variation in this section, because there are many different designs. Because of the extensive variety, it’s not possible to say which one is best, so we’ve included reviews from many different systems. Most include some kind of reservoir to hold water and / or solvent and a raised ridge or “ribbing,” that is used to scrub the bristles of the brush and remove excess paint. The Bob Ross Complete Brush Cleaning System includes a beater rack, a cleaning screen and half of a gallon of odorless thinner. The artist uses a beater rack to literally “beat” the dirty bristles so that all excess paint flies off of the brush. The beater rack can be used in combination with a rectangular wastebasket to catch the errant paint. Its dimensions are 27 x 133cm. Unfortunately, several reviewers noted that it’s not easy to find a wastebasket with those exact dimensions, prompting many to suggest that the company add one to its inventory. After using the beater rack, the artist dips his or her brush into the thinner and rubs the bristles along the cleaning screen to remove all of the paint. The cleaning screen fits in the bottom of a standard metal coffee can (121mm diameter). This can be used in combination with the Bob Ross Complete Brush Cleaning System as a solution for safely carrying solvent in between painting sessions. The bucket has a tight-fitting lid, which can be inconvenient to remove, but does prevent leaks and spills. It is made with rather thin plastic that can eventually wear out, so it’s important not to store chemicals inside for an extended period of time. Some artists complained that the bucket is on the small side and that it’s more expensive than an easy DIY solution combining a standard paint bucket and metal grate. The Holbein Metal Brush Washers come in four different sizes (12, 16, 26 and 72 ounces) and are made from chrome-plated steel. An airtight rubber seal and three tight clamps ensure that this washer doesn’t leak, which makes it the ideal choice for plein air artists who need to carry their supplies with them. It was observed that this product is better suited to mineral spirits and that water can cause it to rust. Therefore, it is not recommended for watercolour artists. This plastic tub contains two different chambers with holes to hold brushes as they dry on the sides and texturized ribbing at the bottom to help clean off the brushes without dirtying your hands. Simply drag the brush back and forth along the bottom of the chamber. It’s well-designed for watercolourists because one chamber can contain dirty water for cleaning brushes while the other holds clean water for painting. Compartments inside the lid also make it easy to store excess oil or acrylic paint. The only negative point that was mentioned is that the cleaning chemicals can compromise the plastic structure if they are allowed to sit inside for too long. The Masterson Fresh Water Rinse Well contains a reservoir for clean water, a reservoir for dirty water and an area where the artist can clean his or her watercolour brush. An additional bottle for clean water is sold separately. The idea behind it was to save the artist several trips to the sink. With the simple push of a button, dirty water is flushed out and fresh water takes its place. This is not the most versatile product on the market, because it was designed exclusively for watercolourists. However, it is a solid product with many positive reviews for its ease of use and effectiveness. The Mijello Water Bucket holds up to two liters of liquid in three different chambers. The handle folds down and ribbing helps to hold brushes flat, so that the artist can set them aside while he or she is working. This helps to prolong the lifetime of the brushes because water cannot run down into the ferrule (metal clamp between handle and bristles), causing damage. The major issue that most artists had with this bucket is its color – a dark green bucket with an orange handle. Many said that they would have preferred lighter colors. The dimensions of the beige Richeson Plastic Brush Bin are 165 x 165 x 89mm. The basin features a brush holder that allows the brushes to be suspended in solvent, rather than resting at the bottom of the bin. This prevents them from curling and losing their shape over time. It also comes with a lid, but several artists noted that the container is not entirely watertight. Holes on the sides can be used to hold brushes, but only those with large-diameter handles. All others slide through. This glass container holds 12 ounces of water or solvent and contains one large metal coil. Artists can run the tips of their brushes along the coil to gently separate the fibers and remove all residual paint. It features a screw-on plastic lid, which can leak and deteriorate over time from prolonged exposure to solvents. Some artists mentioned that they were able to replace the plastic lid with a metal lid from a Mason jar, which resolved most of their concerns. 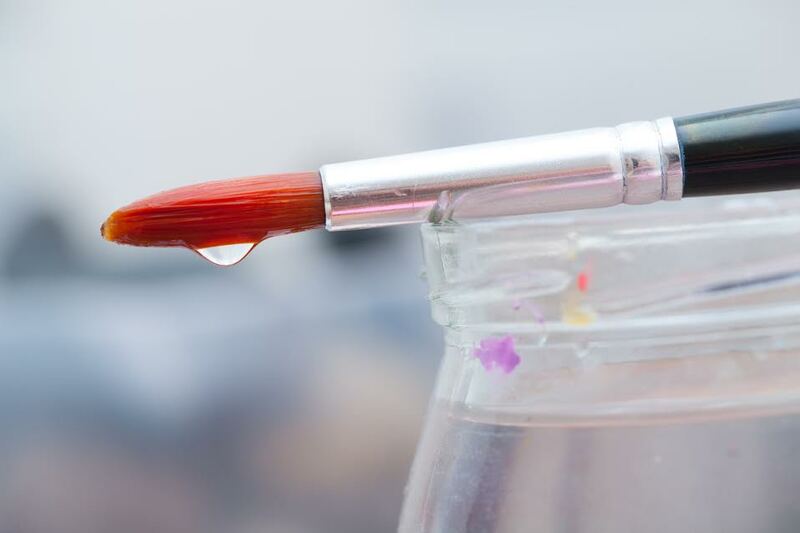 Watercolour and acrylic paints can be removed from paintbrushes with water and a little bit of soap. However, oil and water don’t mix, so the artist who paints with oils requires something much stronger. Traditional mineral spirits are derived from petroleum and can also be called white spirits. Turpentine is derived from tree resin, has a more viscous consistency and is considered to be more toxic than mineral spirits. Both of these products can also be called “solvent” or “paint thinner.” In general, they have a strong odor and can present a potential health hazard if used improperly or with poor ventilation. According to the manufacturer, “Most solvents available to artists come from the industrial paint industry where solvent power and cheapness is prized. Gamsol is special: it is made for products and processes that come into more intimate contact with the body such as cosmetics, hand cleaners, and cleaning food service equipment.” Artist after artist raved about the relative safety of Gamsol and the lack of strong odor that characterizes most solvents, even those that claim to be odorless. The only negative feedback is that sometimes the bottles leak during transportation. More than one artist complained that when the bottle of Mona Lisa Odorless Paint Thinner was dispensed onto a rag to be used for cleaning, a great deal more of the product than was required came out of the bottle, creating a mess. Additionally, this brand is not entirely odourless. However, there was a consensus that the smell is not offensive and not too strong. The price is not too high, but a few reviewers wished that the manufacturer offered larger-sized bottles. According to one artist, who reviewed Richeson Shiva Rectified Turpentine, the “block can” container that this product is sold in is difficult to use. Like the Mona Lisa Odorless Paint Thinner, it is not easy to dispense the product. The odour of this particular solvent is not too strong. It may seem overpowering at first, but most artists get used to it quite quickly. Some even reported liking the odour, which they compared to the scent of pine trees. As far as turpentines go, this one gets the job done. Almost all of the reviewers were pleased with the results of using Rustins Pure Turpentine. There were just a few small issues with the bottle, which can be difficult to open. Some bottles also leaked during shipment. The consensus was that this product smells quite strong, but not everyone hated the scent. Some artists likened it to honey. Though use of this product is fairly straightforward, Winsor & Newton Artists’ White Spirits are highly flammable and potentially dangerous, so it is disappointing that the instructions and safety warnings are printed in a font so small that it’s very nearly impossible to read. That being said, reviewers were happy with the performance of this solvent and most were unfazed by the strong odour. Because it comes from the same manufacturer, Winsor & Newton Artists’ Distilled Turpentine has the same issue as its Artists’ White Spirits product, namely, that the instructions are too small and difficult to read. This is perhaps the most dangerous solvent offered by Winsor & Newton in terms of toxicity and environmental damage, so we advise caution and to do some research into the necessary safety precautions to take before opening this product. Though this product is odorless, it is still a good idea to work in a well-ventilated area with a steady flow of fresh air. That is because Winsor & Newton Sansaodor Low Odour Solvent still contains some of the harmful ingredients found in its line of white spirits. It has the same small bottle and instructions, but none of the strong odour associated with the white spirits and turpentine. There are a number of citrus-based cleaning solutions that are also much less dangerous for the environment and artists’ health than the spirits and turpentines listed in the previous section. However, it is important to be aware of what type of product you are purchasing and to always follow the instructions for use and the recommended safety measures. Though many of the products in this category are less harmful, this does not mean that they are entirely harmless. Citra Solv is made with D-Limonene, which is a liquid derived from the peel of an orange, orange oil and coconut. Our reviewers’ opinions were quite divided with regards to the scent of this product. Some liked the fruitiness and even used it for other cleaning tasks around their homes. Others found it to be overpowering and unpleasant. In addition to being a reliable brush cleaner, many of our artists enjoyed using it to create interesting collage papers out of National Geographic magazines. The solvent is applied and allowed to “melt” the ink off of the magazine pages. As the solvent reacts with the ink, it creates very unique and colourful patterns. Many artists said that Eco-House 115 Xtra-Mild Citrus Cleaner was their second choice after Gamsol’s Odorless Mineral Spirits. It is easier on the environment and also doesn’t carry the same negative health side effects as many other solvents. Artists with asthma and other respiratory conditions reported that this product did not make it more difficult for them to breathe. The only downside is that it dries slowly and, if you’re using it as a paint thinner, it needs some time to react. Almost all of the reviews for Weber Odorless Turpenoid were overwhelmingly positive. This product is a preferred alternative to turpentine. It has only a faint scent of tangerines and gives most artists the impression that it is a lot safer than alternative solvents. However, it still contains many ingredients that can be dangerous if continuously inhaled. Therefore, it’s best to open a window or at least work in a well-ventilated space to avoid overexposure. Weber Turpenoid Natural is a non-flammable alternative to turpentine, which is significant because it is not subject to the same shipping restrictions and surcharges for hazardous materials. However, it is quite expensive and is not as versatile as some of the other products in this category because it doesn’t function well as a paint thinner. It is less toxic than Weber’s Odorless Turpenoid and it can remove dried and caked-on paint, effectively renewing old paintbrushes. The products in this category consist of small jars or cakes of soap that can be used to clean oil and acrylic paints from paintbrushes and many other surfaces. Every brand that we have included is non-toxic and safe to use on hands and clothes, according to the manufacturers. Most have moisturizing or conditioning ingredients to increase the longevity of your paintbrushes and to keep your skin from becoming dry. Regular cleaning and maintenance of your brushes is an important part of caring for your supplies, but rest assured that even the most difficult, dried-on paint can be removed with a little bit of patience and many of the soaps listed below. This kit includes a bar of non-toxic hand soap and a 1 ounce jar of brush cleaner and preserver. All the artist has to do is add water to remove all media – watercolour, oils acrylics, etc. from hands, clothing and paintbrushes. Some reviewers were amazed by their ability to remove even very old dried up paint from their brushes. However, some were disappointed that not all stains, particularly those from strongly pigmented paints, came out of their brushes. Both the bar and the jar are quite compact in size and fit well inside most travel easels. This is an all-purpose product that can be used to clean hands, brushes and work surfaces. It contains linseed oil, which can be kind of smelly, but is non-toxic. It is also quite gentle on the skin and conditions the bristles of paintbrushes, so that they can be used for much longer. The biggest complaint we encountered was that the size of the jar that Jack’s Linseed Studio Soap is sold in is quite small. Some artists would prefer to have a larger quantity in their studios for repeated use and to clean larger brushes. This soap is made from corn and / or cottonseed oil, aloe, glycerin and lanolin. According to the manufacturer, it’s completely non-toxic and has a variety of uses – from removing paint from hands and brushes, to removing grease stains from clothing. Photographers use it to remove the smell of fixing and developing chemicals from their hands. If you use it as a brush cleaner, is important to rinse the brush thoroughly with water before allowing it to dry. Otherwise, not all of the soap will be removed and it may end up causing some discolouration in your next composition. After you’ve cleaned your brushes, if the soap you’re using doesn’t contain a moisturizer or conditioner, it’s best to apply a product like Mona Lisa Brush Shaper. It won’t restore the spring in your bristles and it may not be useful for brushes that have been abused beyond repair. However, the lifetimes of many moderately used brushes can be prolonged by using this shaper. The reviews are generally positive, but some mention the fact that this product is a conditioner only. Depending on your budget, it may prove more economically prudent to purchase a soap that also contains a conditioner. This soap is distinctive for its cherry and vanilla scent and, of course, for it signature pink colour. It is very mild so brushes can be soaked in it for several hours without sustaining any kind of damage and it’s also quite effective at removing old paint. The one piece of criticism we received was about the plastic bottle that contains the product. It can be difficult to squeeze, especially as the artist is holding several dirty paintbrushes. Some artists prefer to have the soap in a bar form for the sake of convenience. Winsor & Newton Brush Cleaner and Restorer works well… perhaps too well. Several artists noted that paintbrushes submerged in this product often fall apart because the solvent eats away at the adhesive holding the ferrule to the bristles. This is particularly true for low-quality brushes. It can also remove colour from the handle of a paintbrush. According to the manufacturer, this cleaner is non-toxic, which means that it won’t kill you if it’s ingested, but it can cause some headaches and / or nausea if you are exposed to it for a long period of time without the proper ventilation. There are many great brush washers and cleaners to choose from and it’s really more of a matter of personal preference. However, we were impressed by the number of positive remarks that the Holbein Metal Brush Washers and the Mijello Water Bucket received. The former for its quality construction and the fact that it is watertight. The latter is just a plastic bucket with different chambers for water or solvents, but sometimes the simple solutions are the best ones. For watercolour painters, we recommend the Masterson Fresh Water Rinse Well because it can save you from spending unnecessary time traveling back and forth from your studio to a kitchen or bathroom sink. In the “Cleaners and Conditioners” category, the most popular products are the "The Masters" Clean-Up Kit because it comes with both soap and small jar and Marvelous Marianne's SavvySoap Cleaners for its extraordinary versatility. Tell us what you do to keep your paintbrushes clean in the comments section below!